Over the last decade the cybersecurity community has made significant progress on collecting and aggregating intelligence that describes threat actors and campaigns, their tactics and techniques, and technical IOCs leveraged by them. However, tracking this intelligence as part of cybersecurity operations or applying it to analytical systems is difficult because it is generally unstructured. Knowledge bases like MITRE's ATT&CK are an excellent example of how useful intelligence can be once it's organized—getting to that end state is a huge challenge. 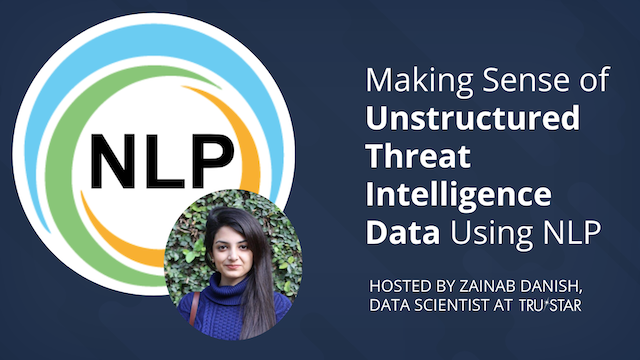 In this presentation, we will show how recent advances in Natural Language Processing (NLP) can help us organize this intelligence and add structure to make it actionable. We will demonstrate how to use Word2Vec: a shallow neural network which understands meanings and relationships between words and can therefore be used to organize the information these documents provide. This exercise trains a Word2Vec model on open source intelligence reports coming from EU-CERT and US-CERT and clusters them into ‘tactical categories’, that can be mapped to the MITRE ATT&CK framework. Since 2014, markets have been hit hard with a growing surge of account takeover fraud. In fact, in 2018 account takeover losses were an estimated $5 billion. The rise in credential stuffing, replay, and phishing attacks have created havoc on traditional security tools. Even next-generation solutions can't keep up with the volume and veracity of these automated attacks. Join our panel of industry experts, hosted by TruSTAR Fraud Intel Analyst, Chris Godfrey and Jarrod Overson, Director of Engineering at Shape Security, to learn about the five essential security strategies that identify the right security tools and how they should be leveraged. The panelist will share real-world use cases that tested their current security defenses and how enterprise intelligence management together with credential security is the next wave of defenses to reduce the widespread effects and losses of account takeover fraud. Join TruSTAR Co-Founder and CEO Paul Kurtz as he hosts a panel with Jerry Archer, CISO of Sallie Mae, and Gary Warzala, Former CISO of PNC, VISA and Fifth Third Bank. In the past twenty years, companies have deployed more technology, processes, and people to defend its applications and systems than ever before… but when pressed, many CISOs will admit they still don’t have a firm grip on the security-related data inside their own four walls. Intelligence Fusion can be defined as the convergence of cyber threat intelligence with other security data sources, including fraud and physical security data. When implemented correctly, Intelligence Fusion can speed threat investigations and lead to a more proactive security stance. Many security teams are adopting a Fusion Centers organizational structure to manage distributed teams and healthcare networks with highly sensitive data. Intelligence Fusion can be defined as the convergence of cyber threat intelligence with other security data sources, including fraud and physical security data, for better enrichment. When implemented correctly Intelligence Fusion can speed threat investigations, reduce analyst cycles, and lead to a more proactive security stance. On this virtual panel, TruSTAR Intelligence Architect Doug Helton will convene security leaders from Blue Cross Blue Shield and Ohio Health to explore modern intelligence management workflows and organizational structures that are making a difference. - How to blueprint an Intelligence Fusion program within your security organization. - Methods for operationalizing multiple data sources and tools into simple workflows. - Real-life Intelligence Fusion use cases within healthcare organizations. Just like intelligence agencies must curate and cultivate high-fidelity intelligence sources, Fortune 500 enterprises are now taking on a similar mission. Join security leaders from the White House’s National Security Council, NSA, and the Enterprise for a discussion about the challenges and opportunities that come with intelligence fusion. Operationalizing cyber intelligence into your security and risk management operations may sound like a simple problem, but the task is complex. You must address speed, false positives, perishable data, and false flags. Government and enterprises are taking a more holistic approach to intelligence and fusing data sources across cyber, fraud, and physical security teams and tools. Join Richard Clarke, the White House’s first Cyber Czar and former Assistant Secretary of State for Politico-Military Affairs, Sherri Ramsay, former Director of NSA's Threat Operations Center, and Chris Day, Chief Cybersecurity Officer at Cyxtera for an exciting panel that will explore the evolution and power of intelligence fusion. A former CIA Officer and ATT's Director of Threat Intelligence sit down to discuss how intelligence operations are revolutionizing the enterprise. With so many different data sources and security endpoints in play, threat intelligence is now fundamentally a question of knowledge management and collaboration. Just like intelligence agencies must curate and cultivate high-fidelity intelligence sources, Fortune 500 enterprises are now taking on a similar mission. So, what *is* an Enterprise Intelligence Officer? You may define the role as a leader who creates business value from intelligence. Enterprise, or Knowledge Management Officers, are in charge of setting intelligence collection requirements, managing multiple intelligence sources, and working across multiple business divisions to architect security workflows while maintaining governance and control. Paul Kurtz, former White House National Security Council member and CEO of TruSTAR, will sit down with Sean Kanuck, Former U.S. National Intelligence Officer for Cyber Issues, and Colin Connor, Threat Intelligence and Cyber Forensics Director, to discuss the changing nature of intelligence operations in the enterprise. You don’t want to miss this discussion. Register today. Learn how IBM & Prudential correlate their cyber and fraud intelligence. As long as adversaries can spend $1 on a campaign and force us to spend $10 to protect ourselves, enterprises will lose the war on cybercrime. Rather than building taller silos of data that become even bigger targets for criminals, enterprises must come together around common means of data exchange and collaboration. Join our moderated panel with IBM & Prudential security executives to learn how they organize their cyber and fraud teams and correlate threat intelligence and fraud data across teams to be a force multiplier for their security resources. Everyone collects threat intelligence data, but how do you effectively put it to use and optimize it into your SOC workflow? In this panel discussion, TruSTAR will interview two Fortune 500 security analysts about how they optimize threat intelligence into their enterprise security operations. Our panelists will be Mike V., Senior Incident Response Analyst at a Fortune 500 healthcare company, and Troy Vennon, Cyber Threat Engineer at Columbus Collaboratory. - Workflow - What are your favored data sources and how do you operationalize this data throughout your SOC operations? - Investigation Tactics - How do you escalate events from L1s to L3s? How is your team organized? What best practices help you move faster? - ROI - How do you report results to your CISO and the board? A threat intelligence entrepreneur sits down with two former NSA spooks to discuss the future of security operations. In this valuable executive panel, TruSTAR co-founder and CEO Paul Kurtz will interview two former seasoned cybersecurity executives from the NSA. Based on thousands of hours managing SOC operations and operators and developing defense strategies, the panelists will discuss the biggest events of 2017 and what’s ahead in 2018. The panelists will also discuss what works, what doesn’t, and key gaps requiring attention in security operations centers today. Both SOC managers and operators will find Sherri and Tony’s insights helpful as we move into the new year. This will be an interactive discussion infused with current threat intelligence research along with professional anecdotes from our highly-seasoned panelists. Today we fight adversaries individually, not collectively. Companies are working in silos to defend their individual infrastructures. Security operators and defense teams do not have visibility into cyber security incident information from their peers, even though they may be seeing the same attack methods or adversaries. The lack of an effective exchange and collaboration between companies is the Achilles heel our enemies continue to exploit. Come and join a discussion about a new cybersecurity model that maximizes the use of the network (much like the bad guys) and incentivizes the exchange of actionable threat incident data. We'll look at recent critical infrastructure hacks such as Grizzly Steppe, WannaCry and CrashOverride and discuss how we can better protect ourselves for future attacks. Leaders from Columbus Collaboratory, R-CISC and TruSTAR Technology will describe HOW and WHY they used threat intelligence exchange to quickly respond to the breaking global WannaCry ransomware attack and share tips for how to incorporate threat intelligence exchange into your security workflow. In light of the recent publishing of thousands of CIA-related documents by WikiLeaks - the largest leak of classified documents in CIA history, we will discuss the implications of the revealed information across industries and users, in the US and globally. - What is Vault 7 and how does it affect you? - What can we expect, as more documents get releases? - How will this affect organizations, and the relationship between the tech industry and government agencies? It seems like it’s every other day the U.S. Government Accountability Office (GAO) is issuing a new critical infrastructure (CI) condemnation on a government agency or an intrepid security researcher is playing out what would happen to our electrical grid if a ransomware attack were to occur. But have we ever paused to consider exactly what it takes to protect critical infrastructure? In doing so, we can learn how to better protect ourselves. This session will highlight the similarities and differences of what it takes to protect critical infrastructure compared to the enterprise. Threat models are changing, which require a change in core capabilities necessary to protect CI. We’ll pull up some common tactics, techniques and procedures (TTPs) used in real world attacks using TruSTAR’s threat intelligence exchange platform to show how intelligence exchange can play a role in protecting CI in the future. This session will be led by Paul Kurtz, co-founder and CEO of TruSTAR Technology and former Senior Director for Critical Infrastructure Protection on the White House's Homeland Security Council (HSC), as well as Shimon Modi, Director of Product & Technology at TruSTAR and former Cybersecurity R&D Manager at Accenture Technology Labs, where he led the innovation strategy and build out of the Industrial IoT security capability. Discover the latest trends in cyber attacks and how they are shaping the security strategy across industries and on a national level. Join this keynote panel session for an interactive discussion on the emerging technologies and tactics used by attackers, the role of artificial intelligence and machine learning in cyber attacks and cybersecurity, and the best practices for improving security for your organizations. We need a different type of intelligence exchange in this day and age - an exchange that is designed for timely and actionable insights. TruSTAR finds that there are 2 core pillars that enable this: Protecting Against Unwanted Exposure + Immediate RoI to Incentivize Early Use. We will be covering the 1st pillar in this webinar. The focus on privacy and the protection of unwanted market and reputational risk is a key ingredient to enabling a powerful and active exchange. Join TruSTAR's CEO Paul Kurtz and learn about the value of Redaction and Anonymity when thinking about a successful and active incident exchange. · How to design an intelligence exchange with broad participation and actionable reports. TruSTAR is an intelligence platform that helps organizations leverage multiple sources of threat intelligence and fuse it with historical event data to prioritize and enrich investigations. Built for security and fraud teams, TruSTAR uses machine learning and automation to operationalize data throughout an analyst’s workflow, freeing up time for higher-priority events. The most valuable security data is often locked inside silos in and across companies. TruSTAR breaks down these silos with its Enclave knowledge management architecture. Enclaves give complex teams customization, integration, and granular access controls that enable collaboration. TruSTAR is the technology infrastructure that powers many of the U.S.’s largest ISACs and ISAOs, and has enterprise customers that span across Finance, Retail, Healthcare, Aerospace, and IT. Learn more at www.trustar.co and follow us on Twitter at @TruSTARtech.